Peterborough United have been handed an initial allocation of just 944 tickets for the League One derby at Northampton Town on Saturday, November 19. Posh will apply for a further 500 tickets in the South Stand at Sixfields when the first batch is sold out. Posh start selling the tickets to season ticket holders at 9am tomorrow (October 13). They go on general sale from October 20 after Forever Posh, Junior Posh and Posh We Are members have had a chance to purchase. Northampton are expected to sell their entire allocation of 2,400 tickets for the League One trip to the ABAX Stadium next Tuesday (October 18). 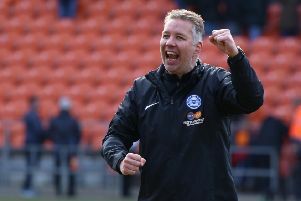 Posh have sold 5,000 tickets for that game, but that includes season ticket holders. The ABAX Stadium Box office will open late tomorrow and until 3pm on Saturday (October 15). Tickets are priced at £22 for adults, £18 for over 65s and under 21s, £10 for under 18s with juniors under 7 admitted free of charge. Disabled tickets are sold as per those categories with a carer admitted free of charge where required (proof of carer requirement may be requested on entry). Tickets will be available at www.theposhtickets.com, via the Ticketmaster hotline 0844 847 1934 and in person at the ABAX Stadium Box Office (season ticket holders please bring your season card). The Box Office and Club Shop will be open until 7pm on Thursday October, 13 and from 10am until 3pm on Saturday 15th October.